Japanese Knot Bags are very handy and feature two handles. One handle is shorter than the other so you can pull the longer handle through the shorter as a quick and unique closure for the bag. I thought a Japanese Knot would be a cool idea for a recycled tote bag. I used mainly recycled grey Walmart plastic bags to crochet the tote bag with 4 blue plastic bags for the stripe. It took about 50 plastic bags cut 1 inch wide and made into plarn (plastic bag yarn) to crochet my Japanese knot tote bag. I loved how the blue really helped set off the bag to give it a nice look to an otherwise boring grey bag. 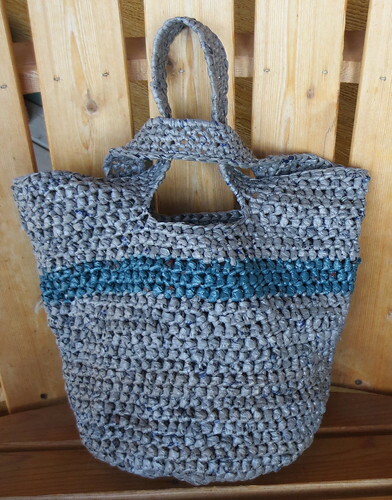 Overall I am very happy with the results of my latest crocheted reusable bag. Here is a closeup of the top with the Japanese knot used for the plastic bag tote closure. As always, here is the free crochet pattern so everyone can crochet their own recycled Japanese knot tote bag. All directions are in US crochet terms. 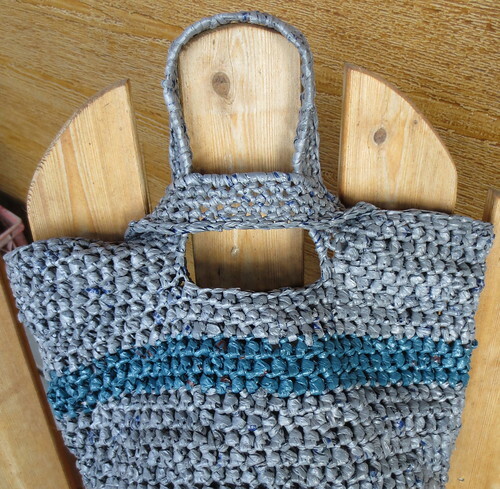 Bag measures 14″ wide flat across the front, 12″ tall, 9-1/2″ round bottom with one handle 10″ long and the other 15″ long. It has been 7 years since my cancer surgery and follow-up treatments. I just wanted to post an update and give thanks for my 7 year mark of beating the beast! It has been a long and scary journey but I am doing well. After undergoing surgery, chemo and radiation treatment, I can say that I am NED (no evidence of disease) and am just so happy to be healthy. Check out this cute little winter sweater pattern I crocheted for my dolly. Doesn’t she just look snugly warm in the sweater? This doll is 11 inches long with a thick cloth body. 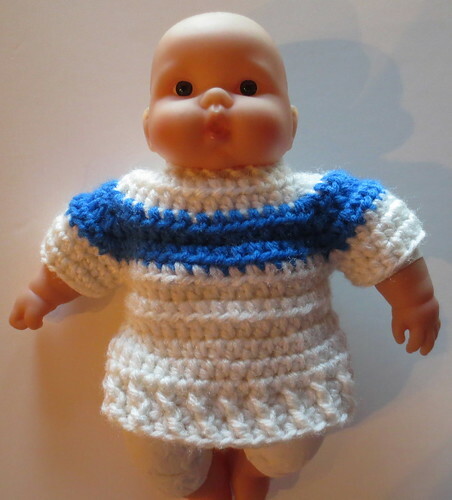 I crocheted this dolly sweater using a H (5 mm) crochet hook and some worst weight yarn. The free crochet pattern can be found at Crochetville from Darksi who has created many cute and free doll outfits over the years. Here is the link to the Seasoned Just Right outfits with all the free pattern details. Using crocheted diaper covers is a great way to provide a little extra protection for plastic disposal diapers or as a soaker cover over cloth diapers. I used Boomer Beanies worlds best diaper cover pattern and followed the pattern as written using just a single strand of yarn for my first diaper cover I crocheted. 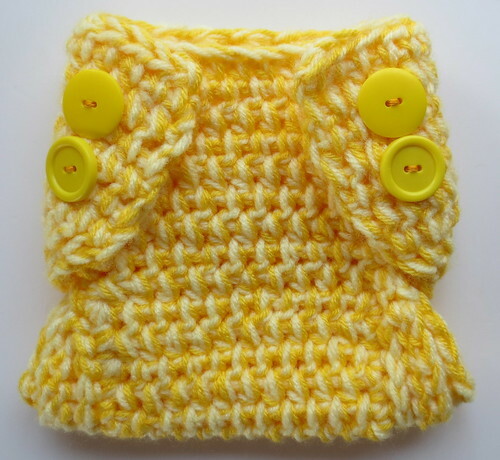 Several other people had used the same crochet pattern and created a double thick diaper cover by crocheting with two strands of yarn held together. I loved this idea and set out to adapt the pattern to create my own variation of a double thick diaper cover. © 2015 My Recycled Bags.com - Powered by Wordpress.